Seatruck Ferries has a BAF in place for all shipments. The BAF is adjusted monthly based on the Rotterdam USD index average price of IFO 380 Grade Fuel Oil with a 3.5% sulphur content and the £/$ exchange rate. IFO380 is the main engine fuel type that we use. We do not currently include the fluctuations in generator fuel cost as part of our BAF calculations. The table below shows the scale that we use in tabular format. 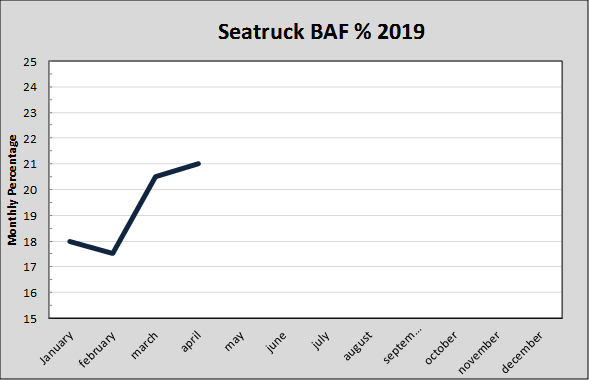 * Thereafter BAF increases by 0.5% per £5 fuel cost increase.